Climate change is one of the greatest challenges facing global society. The debate over what to do is confounded by the uncertain relationship between increasing greenhouse gas emissions and climate change, and the impact of those changes on nature and human civilization. 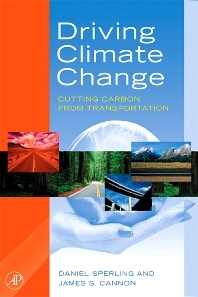 Driving Climate Change will provide professionals and students alike with the latest information regarding greenhouse emissions while presenting the most up-to-date techniques for reducing these emissions. It will investigate three broad strategies for reducing greenhouse gas emissions: 1) reducing motorized travel, 2) shifting to less energy intensive modes, and 3) changing fuel and propulsion technologies. Findings will be presented by the leaders in the field with contributions from professors, researchers, consultants and engineers at the most prominent institutions - commercial, academic and federal - dealing with environmental research and policy. Environmental professionals, engineers, scientists, policy-makers; energy and transportation professionals - researchers and managers. Professor of Civil Engineering and Environmental Science founding Director of the Institute of Transportation Studies (ITS - Davis) at UC Davis. He is also co-director of UC Davis’ Fuel Cell Vehicle Center and specializes in transportation technology and environmental impacts and travel behavior. Dr. Sperling is recognized as a leading international expert on transportation technology assessment, energy and environmental aspects of transportation, and transportation policy. In the past 20 years, he has authored or co-authored over 140 technical papers and six books.